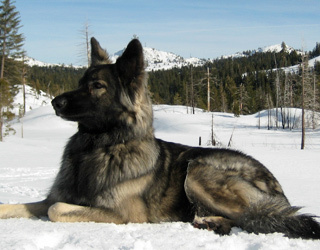 "Located along the Pacific Crest Trail in the high Sierra Nevada Mountains of Northern California, Pacific Crest is a small kennel dedicated to scientifically breeding Shiloh Shepherds for health, temperament, and that "Old Shiloh Look". We have no kennel runs; all of our dogs are raised and live in our home where they receive loving attention and training. Puppies will be raised in their own "dog apartment" in our home, where they are exposed to the sights and sounds of our active household. Since we live in the middle of the Plumas Eureka State Park, our dogs have free run, and enjoy much off-leash, outdoor exercise everyday. This means that our dogs are healthy, well muscled, and calm. Pacific Crest dogs are extensively health and temperament tested prior to breeding. We participate in conformation shows, where they have done well. Our dogs have excellent pedigrees, and are descendants of the champion dogs who made the breed. We are active members of the ISSDC and our regional club, the ISSDC West/PNW. Please feel free to contact us to inquire about upcoming breedings and our breeding program."